Libcom.org interview Jano Charbel, an Egyptian anarchist and blogger, on the January 25th uprising, how it has progressed and the possibilities for working class struggle in Egypt and beyond. 1) What forms of workers' organisation has Egypt seen since the events of Jan 25th? Since January 25th the Egyptian masses self-organised themselves into numerous grass-roots organisations. Civil-society associations mushroomed nationwide, including 'popular-committees', town-councils, cooperatives, independent trade unions, workers' parties and coalitions. These grass-roots associations emerged spontaneously, out of necessity. It was a sort of organic-anarchism that was practiced by millions of Egyptians. The defeat of Egypt's police forces on January 28th led to their withdrawal and disappearance from the streets. Their disappearance was also intended to create a 'security vacuum'. To be precise, it was the uniformed police forces which disappeared, and the plain-clothed armed police which stepped in to terrorise neighborhoods. Furthermore, in many cases police officers emptied prisons; criminal elements were armed and given orders to loot, shoot, burn, and wreak havoc. There were also a number of jail breaks orchestrated by family members and friends of the prisoners. In response to this 'security vacuum' neighborhood patrols emerged, along with teams of civilians to direct street traffic. Others manned roadblocks and barricades established by the 'popular-committees'. 'Popular committees' sprung-up in neighborhoods across the country - to protect homes, shops, agricultural lands, crops, livestock, automobiles and other properties. The people in these committees armed themselves with anything they could get their hands on: wooden sticks, iron rods, kitchen rolling-pins, clubs, swords, guns, rifles, mace-spray, Molotovs, etc. In terms of industries and services, there were some incidents of capital-flight and employers' lockouts and as a result there were also some brief experiments in factory occupations, and workers' self-management. Egyptians are still organizing themselves into trade union committees, general unions and federations. These labor unions, professional syndicates, unions for peasants and small farmers - are being established independently of the Egyptian Trade Union Federation (ETUF.) This yellow state-controlled federation had monopolized the union movement since 1957. An independent union movement existed from the turn of the 20th Century, but was crushed following the military coup of 1952. Greek anarchists (based in Cairo and Alexandria) were instrumental in establishing Egypt's first trade union - the cigarette rollers' union in 1899. Italian anarchists were also involved in Egypt's union movement until the 1950s. The independent trade union movement re-emerged in late 2006, but only really materialized in late 2008. 2) How much continuity has there been from the 2007-8 strikes? Have those strikes and other workers struggles influenced the 2011 movement? There is an almost seamless continuity in the labor strikes and their demands, which began in December 2006. The demands for independent trade unions and an adequate minimum wage emerged from the Mahalla Textile Strike in December 2006. These are still the primary demands of millions of workers across the country. A national minimum wage of LE 1,200 (around $US 200) was one of the few economic demands raised during the 18-day uprising, which began on January 25. It remains a popular demand of the revolution until this day. Workers have also been demanding a maximum wage (or salary-cap) for administrators and managers. On January 30, four independent unions and syndicates joined forces to establish the 'Egyptian Federation of Independent Trade Unions.' EFITU announced its active solidarity with the Egyptian revolution, and is still challenging the undemocratic and unrepresentative authority of the state-controlled ETUF. Then on February 8th a new strike wave emerged and dictator Hosni Mubarak abdicated three days later. This strike wave dealt a fatal blow to the Mubarak dictatorship as it involved public transport workers across greater Cairo, along with other public sector workers; laborers along the Suez Canal also began protesting and threatened to strike. 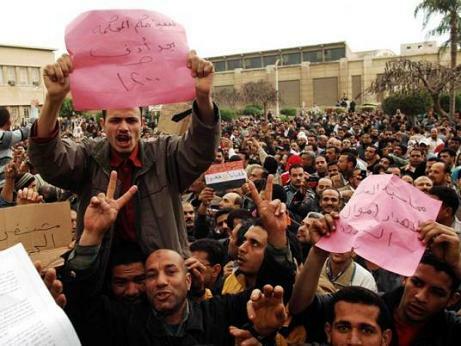 Soon after Mubarak's abdication on February 11, the public transport workers established their own independent unions. Tens of thousands of workers followed suit, and unions mushroomed across the country. There are some 30 independent unions now in existence, including: blue-collar and white-collar unions, professional syndicates, along with farmers' and peasants' unions. Estimates suggest that the independent union movement has an aggregate constituency of over 250,000 - from quarry workers to hospital staffs, from seasonally employed agricultural laborers to pensioners. The state-controlled ETUF reportedly had a membership of over 4 million, but countless numbers of workers are quitting this yellow federation. The corrupt and undemocratic ETUF is soon expected to wither away. Other than unions, workers are now organizing themselves into workers' parties and coalitions. The Democratic Workers' Party (with a membership of more than 1,000) has informally been established. However, the Egyptian (interim) constitution and political parties law prevent the establishment of class-based parties. Workers in this party intend to push ahead nonetheless. 3) At the start of the movement, it seemed that people both in Egypt and abroad saw the police as enemies of the movement, and the army as on the side of the people. What is the general feeling towards the army now? Yes, the general Egyptian populace hated the interior ministry, the police forces, and especially the State Security Investigations Apparatus - due to their oppressive practices, espionage, corruption, brutality, systematic torture, and extra-judicial killings. January 25th used to be Egyptian Police Day. Thousands poured out onto the streets across the country to protest against Mubarak and his police-state on this day. Three days later, Mubarak's police forces were decisively defeated. On January 28th, when the armed forces were first deployed across Egypt's streets, there was a sense that the army is more respectable and honorable than the police. Which is not saying much. Yet the army was in fact patrolling streets and protecting neighborhoods. They (initially) chose not to fire upon protesters. They were policing, while the police had only been assaulting, shooting and terrorizing. People in Tahrir Square, and across Egypt were chanting "the army and the people are one." This relationship quickly spoiled when the Supreme Council of the Armed Forces (SCAF) reared up its ugly head. Since February 11, this military junta has assumed (interim) dictatorial powers. The SCAF currently acts as the executive, legislative, and judicial branches of the state. The state is now in the hands of Mubarak's generals; the ruling military junta is presided over by Field Marshall Hussein Tantawi - Mubarak's loyal lapdog, and minister of defense for 20 years. Since February 11, when SCAF assumed its dictatorial powers, over 7,000 civilians (including hundreds of political activists) have stood trials before military tribunals. Thousands are serving prison sentences which were hastily handed down, and do not have the right to appeal. This is happening while only a handful of Mubarak's corrupt and criminal billionaire ministers stand trial before civilian courts. Hosni Mubarak is allowed to play dead at a five-star hospital suite in Sharm el-Sheikh, while Suzanne Mubarak has been released on bail. Their billionaire children are locked up pending trial. Yet this deposed family has access to the best lawyers, they have the right to due-process, and can appeal and re-appeal their cases before the courts. Furthermore, the SCAF has moved to crackdown against popular dissent - both on the streets and in factories. The armed forces have repeatedly assaulted, and even killed activists occupying Tahrir Square. The armed forces even have a makeshift torture center by the Egyptian Museum were Tahrir's activists have been brutality assaulted, and female activists have been forced to undergo virginity tests. As for workers and labor strikes, SCAF ordered a violent attack on striking textile workers in Shebin el-Kom (in the Nile Delta). Several were injured and detained in Shebin el-Kom, as was the case with striking employees of petroleum companies, and a leading unionist in the public transport union movement is on trial for 'instigating strike action.' On May 10, in the City of Mahalla, the army forced striking physicians to break their strike - by threatening them with arrest and trials before a military court. Furthermore, in April SCAF secretly passed a law criminalizing labor strikes - with penalties of imprisonment and/or fines of up to LE 500,000 (more than $US 83,000)! The fines stipulated are absurd because they are far beyond the means of any Egyptian worker or employee. The SCAF has, over and over again, proven that it is a fascist-leaning group of Mubarak's military men. 4) What role have women played in the protests? Women played a very important role during the 2007 strike wave (Mansoura-España occupation, Mahalla textile strikes etc), has the same been true in 2011? Has a specific working class women's politics emerged? Women have been on the front-lines of the protests and marches from the very beginning of this revolution and in protests leading up to it. This has been the case ever since the Revolution of 1919. Throughout the course of this revolution, women have proven to be capable and militant speakers at Tahrir, nurses and doctors in the field hospitals around the Square; they served as cooks and street-cleaners. Women occupied the square, distributed leaflets, protested, slept-in, and even fought off police and thugs in the same capacity as men. On the neighborhood level, women served in the 'popular committees'. They prepared food and beverages for the street patrols, and on many occasions they prepared Molotov cocktails. Some women and girls could even be seen manning street patrols and roadblocks. In terms of industry and services, women have proven to been militant strike-leaders and protesters. The example of Mansoura España is just one of many where women have been at the forefront of the class-struggle. Women are increasingly involved in the independent union movement, and many are now leading figures within this movement. A liberal female activist, Bothaina Kamel, is nominating herself for Egypt's presidential elections. This is an unprecedented development, although she is unlikely to succeed this time around. I respect her effort and determination, yet I believe that women must liberate themselves on the grassroots level - and cannot be liberated from above. This revolution has empowered countless thousands of women, and - through their actions and bravery - women have served to shatter many sexist stereotypes. In any case, however, Egyptian women are still a very long way from equality with men, and there are many - social, economic, political, educational, familial and religious - shackles left to be destroyed. 5) What is the current make up of the left in Egypt? Are there any anarchist groups? Marxists/Trotskyists/Maoists? What is their influence within the movement and Egyptian society? What are the relationships between these groups like? The left in Egypt very broadly includes (the center left): 'Tagammu' National Progressive Unionist Party, Nasserists and the their Party, and the 'Karama' (Dignity) Party, along with an assortment of social democratic groupings. The radical left includes the Egyptian Communist Party, two Trotskyist groupings - the Revolutionary Socialists, and the Socialist Renewal Current - amongst others. I hear that there are some Maoists still in existence. Despite my disliking of state-socialism, party politics and vanguardism - and despite my distaste for the authoritarian ideologies of Lenin and Trotsky - I believe that the Trotskyists are our comrades in the class struggle. They have done some excellent work in terms of encouraging workers to unionize and strike for their rights. A radical leftist front, comprising five Marxist groupings, was established on May 10. I don't know to what extent we anarchists should coordinate with this front but in any case I express my solidarity with them, and hope that this front will serve to radicalise the revolution, to confront capitalist exploitation, sectarianism, and religious reaction. In terms of anarchist groups there is one - very loose - grouping in existence; and perhaps another such grouping in Cairo or Alexandria. We are still getting in contact with other self-proclaimed anarchists, including closet-anarchists and anarcho-curious people. In our individual capacities, we Egyptian anarchists have been involved in the 'Kefaya' Movement since December 2004. 'Kefaya' (meaning "Enough") is an opposition umbrella movement which helped to prepare Egypt, and a generation of activists, for the January 25th Revolution. Anarchism is not (yet) a movement or political current in Egypt, however, the number of self-proclaimed anarchists has grown exponentially, and continues to grow with the ongoing revolution. In our limited capacity, we Egyptian anarchists have been involved in supporting workers struggles, promoting workers' self-management, graffiti/street art, marches, protests, and the occupation of Tahrir Square. An Egyptian-ized red & black anarchist banner was unfurled for the first time at the Labor Day rally in Tahrir Square, on May 1, 2011. 6) In many of the struggles across North Africa and the Middle East, national flags have been flown and the movements have been seen by many as a struggle to free 'the nation' from tyranny. To what extent do you see the nationalism displayed at these protests as problematic? Has national unity been seen as a reason for the working class to keep quiet about their needs and interests? Yes, the nationalism and flag waving are overdone. It's understandable that people are happy to reclaim their countries, to feel nationally empowered, and that they actually belong to the countries for which they struggle. Yet nationalism is used to mask the class struggle, to give the populace the impression that we are all struggling for the same Egypt. Some nationalist sentiments even border on fascism, such as the slogan "Egypt is above all! ", reminiscent of the Nazi's "Deutschland über alles!". The SCAF and interim cabinet have played on such nationalist sentiments in order to portray labor strikes, the class struggle, and street protests as running against 'Egypt's national interests.' In terms of their propaganda, the interim rulers have gone so far as to refer to labor strikes as being part of the counter-revolution! 7) Where next for the movement? What opportunities or dangers do you see the movement facing in the future? The first recorded labor strike in history took place in Egypt over 3,000 years ago. It's only natural, in the course of this ongoing revolution, that Egyptian workers will continue to strike, struggle and organize for their rights, freedoms and for social justice. Egypt's revolution will be a failed revolution if it only brings regime change, without bringing social justice. Social justice, equality and freedoms will not be handed-out by this government or the next, these rights must be seized by the people. The people's revolution in Tunisia sparked the revolution in Egypt, which sparked popular uprisings in Yemen, Bahrain, Algeria, Libya, and Syria, amongst a host of other Arab countries. The revolutionary tide which began with the year 2011 has spread like wildfire throughout the Arab World, because the Arab peoples have been oppressed by their tyrannical states - under very similar dictatorships - since they gained independence from colonial powers. This revolutionary tidal wave has reverberated as far as China and Swaziland. The effects of this revolutionary wave have also been felt at the capitol building in Wisconsin. This class struggle has since spilled over into Ohio and Indiana, amongst other American states. Wisconsin's protesting workers praised Egypt's revolution; and Egyptian unionists delivered speeches in Tahrir Square in solidarity with America's workers and their struggle for their right to collective bargaining. The revolutionary tide, or "Arab Spring," has influenced protests and occupations in both Spain and Greece. People are now speaking of a "European Spring." I can't predict where this is going, but I hope that the "Arab Spring" does blossom into a "European Spring." Hopefully this popular wave of discontent will bring about other revolutionary springs in North and South America; in Africa, Asia, and Australia. Whatever names are pinned on this revolutionary tide, I hope that the people of the Arab World - and the World at large - empower themselves. I hope that people will reclaim their rights and freedoms from states, generals, businessmen and capitalists; from clergymen and institutionalised religions. I'd like to ask Jano whether he agrees that the relaxation of freedom of movement between Egypt & Gaza is a major gain won by the Egyptian revolution? I love libcom.org, but why don't you guys supply source details for your articles, including date of writing or original publication? It's often relevant to know when some item was actually written. Supplying such information would be a great improvement! This is an original libcom interview, published in May of this year I think. Some articles will have source details, others won't. It really depends on the academic bent of the person submitting the article. After all, this is a site for struggle not for writing papers. As an academic, however, I do understand your frustration. Hey, yeah that is a good point. We did this interview ourselves and it was published on 28 May 2011. When the redesign is complete it will have the publishing date of every article displaying (at the moment only news and blog articles have this). Where articles are taken from elsewhere we list the source for all articles we put up ourselves. With content from our users, we ask that people do this but sometimes people do not. We ask that people add this information where they know it, but some does get missed.